Pirate Berlin « kNOw Future Inc. 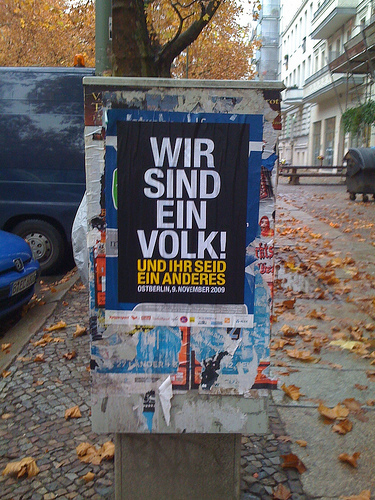 Early last August Pirate Party posters appeared in large numbers throughout Berlin in anticipation of the city elections in mid-September. Since the Federal elections of 2009, where they reaped much media attention as new contenders, things had been quiet. On that occasion their final vote came in just under 2% nationally, but this concealed a vote in Berlin that was nearly double that level, with local support in the constituency of Friedrichshain/Kreuzberg reaching 6.2%, promising them seats in the next local election. The 2009 campaign marked the first time that online public sphere began to be taken seriously as a factor in the vote, and through a combination of their intense social media presence, popularity amongst young voters as expressed in online polls and the general emphasis on network politics the PP became positioned as the ‘party of the internet’. Germany has a distinct engineering culture due to the scale and centrality of its technology-driven industries, and the PP drew heavily from this pool both in terms of activists and policy relevance, but this narrow techno-fetischism also constituted an inbuilt limitation to their appeal. 2011 was different. What was immediately striking about the PP’s poster campaign was its playful tone, self-irony and lack of focus-group sleekness. So much so, that the whole thing looked initially as if it might be a prank. Notable also was the expansion of the issues addressed: this was not an agenda of pure technophilia: posters laid out their support for a guaranteed basic income, decriminalisation of drugs, secularisation and increased transparency in political administration. In addition they proposed the introduction of city-wide free public transport, and set out alternative ideas about education in a country witnessing declining graduation at third level in comparison with the preceding generation. I think it’s difficult to grasp what happened in Berlin without an understanding of the wider national political climate as well as local factors in the city itself. Since their election in 2009 the CDU/FDP coalition has met a series of defeats on a regional level. Two issues in particular have occupied public attention with devastating consequences for the government. The first is the fight over the construction of a new central train station, Stuttgart 21, in the regional capital of Baden Wurttemberg. Opposition by a broad alliance of environmentalist groups culminated in the occupation of a green area, subsequently evicted amidst massive police violence. Clashes on demonstrations are not unusual in Germany, but on this occasion the victims were not principally anticapitalist youth, but middle class ‘civilians’ – with disastrous consequences for the local junta. As a result the CDU lost control for the region for the first time in more than half a century. Then came the nuclear accident in Fukushima, which intensified an already stormy and longstanding political debate on nuclear energy, leading to the reversal of the government’s policy postponing reactor closures. The most immediate beneficiaries of this events were the Green Party which saw instant growth both at the polling booth and in opinion polls. Combined with an array of smaller controversies the governments popularity sank, with the SPD also putting a floor on their recent decline in support. Wir Sind ein Volk: Ihr Seid ein Anderes! A reminder is in order here that the German economy has significantly outperformed the rest of Europe in the last couple of years. 1998-2003 was a period of recession, after which growth improved until 2009 where there was a sharp contraction in GNP of 5%, directly linked to the fall in global demand for Germany’s exports. Since then however, exports have recovered both to other EU states and emerging markets. Low levels of home ownership and the difficulty of accessing mortgage finance sheltered Germany from the financial events which have unfolded since 2007, although German banks and investment funds have been damaged due to investments made overseas, notably in the US sub-prime market. What is poorly understood overseas however is the regional nature of the German economy, and the degree to which it continues to be centered on key nodes in former West Germany: a Munich-Nuremberg axis in Bavaria, Baden Wurttemberg, Frankfurt (finance), Koln, Hamburg and the Ruhrgebiet. Berlin is cut off both in terms of human capital and infrastructure from these areas, and struggles as a result. The local economy is heavily reliant on public sector employment in government and administration, tourism, and construction. While there is some software, pharmaceuticals and media production, they are in relative terms discrete employers. The biggest new employer is the German intelligence agency, the BND! Consequently local unemployment remains stubbornly high, over 13% according to official figures, and wages are low. A corollary of the weak economic situation has been the relatively low cost of living, especially in terms of rental rates. Notoriously this has attracted a lot of under-remunerated cultural producers to make the city their home. But in the last four years rents have increased precipitously, between 15-20% annually in some centrally located areas, and when combined with weakened tenant protections and reduced investment in social housing; the result has been significant levels of displacement. New construction is occurring but is confined to apartments marketed to investors from other areas of the country and abroad. In fact this process has been underway since the 1990s, but had abated during the 1998-2003 slump – now it is back with renewed vigor. Local conflicts over urban development and planning have intensified and drawn in wider tranches of the population. The failure of the local administration – a coalition of the Social Democrats and die Linke – to respond to the resultant insecurity, combined with the poor economic opportunities available have opened the door to other forces. Previously the Greens would have been expected to clean up in this scenario, but they are perceived increasingly as the party of a lifestyle-defined middle class which has jettisoned its radical DNA, and in Berlin this doesn’t play as well compared to prosperous regions in the west. In sum the conditions for a new protest party were ripe, and the Pirate Party were there to capitalise. They took more votes off die Linke proportionally than from anyone else, especially in the constituencies in the east. In areas characterised by a high level of conflict over housing such as Friedrichshain, they scored their highest results in absolute terms, hitting up to 17%. This area had been the scene of a massive campaign in defense of a squatted ‘house project’ (where people live collectively and conduct cultural and social activism), Liebig 14, which was evicted in February of this year. One element of the PP’s programme is to enable access to loans for tenants who want to buy their houses out from their owners rather than there being released on the open market. Meanwhile, on the border of Prenzlauer Berg and Wedding one of the city’s most popular parks is slated to be partially developed as condominiums, provoking anger and regular demonstrations in which the PP have been active. Along the site of the former wall, what was once social housing (built during the massive architectural project of the 1980s, the IBA) is in the process of reverting to private ownership, with increases in rents of up to 200%. This does not mean that the PP is a new Tenants Rights Party, but simply that the failure of the historical ‘alternative’ and ‘left’ parties has alienated many and opened the door for others. What I want to get across is the complexity of trying to analyse the Pirate Party’s extraordinary result. While no enthusiast for electoral politics, I have been involved in the fight against intellectual property expansionism and have thus paid attention to the progress of the various PP’s since the start. But the copyright question which instigated the organisation’s creation was a footnote in the election. Nonetheless there has been enough happening in the copyright and surveillance realms to steel activists attracted by this issue. Germany, in fact, has had one of the most frantic enforcement campaigns in Europe in recent years, with the development of what is widely referred to as an enforcement industry where IT companies are contracted to trace those sharing files online so that lawyers can then make demands of ‘compensation’, an approach exemplified by companies such as Constantin GMBH, rights owners responsible for the famous sweep of Downfall videos from youtube. In October CDU politician Siegfried Krauder floated a proposal for a three strikes style law also in Germany, even though this would go against the coalition agreement made with the FDP (which contains a determined civil libertarian faction). Elsewhere, the campaign against intrusive surveillance was enlivened by revelations that police in Dresden engaged in generalised interception and parsing of mobile traffic and SMS during popular demonstrations against a neo-fascist rally in Dresden last winter. The Pirates took 8.9% in the Berlin election. So unexpected was this that they cannot in fact fill all their seats. Every candidate for the City was elected, but several of them were also elected to the local councils in their areas, and due to the prohibition on dual-mandates some will go unfilled. Opinion polls have put them on 8% nationally, but it will be difficult to sustain this if they do not transform novelty into meaningful intervention. The crucial question is what would a meaningful form be. Events elsewhere such as the Occupy movement reflect a general distrust of the political system and its modes, a humor which arguably is analogous to the motivation driving the Pirate Party’s success. If this is so, then there is a case that the PP would be best served not by playing the Parliamentary game with too much earnestness, but rather should expose it and demonstrate the castrated notion of participation which it represents. Following the election a debate kicked off in the TAZ newspaper regarding the left-wing credentials of the party, or lack thereof. Opinions vary, as do the self-descriptions of prominent party members. Current leader Sebastian Nerz is a former member of the conservative CDU, and the party also includes many former liberals; he prefers to charcterize it as a socially liberal progressive party. From the other side of the spectrum the Pirates have picked up members from all over the left, including a former chairperson and MEP of the Green Party, Angelika Beer, and former MP Herbert Rusche. Parallels have been drawn between the struggle between ‘vollis‘ and ‘kernis‘ in the PP and the earlier fight in the Green Party between ‘realos‘ and ‘fundis‘. In the PP context this refers to a tension between those favouring a minimal program based on technological issues and those who want the party to develop a full programme, including the thorny issues around the social state. A congress in Bingen in 2010 grappled with these issues unsuccessfully, but the question was resolved at another meeting later that year in Chemnitz. On that occasion the membership endorsed a proposal to support a guaranteed income and to back the introduction of a statutory minimum wage in the interim. This move was actually opposed by the then leader Jens Seipenbusch. The result in Berlin clearly favours the more expansionist current in the organization. On the back of their gains, however, the PP has now also made itself a target for more calculated attacks. The Greens and die Linke will be ruminating on how to deal with the threat they pose, with Renate Kunast (the local Green leader) quipping to a business audience before the election that they could be ‘rehabilitated’, and presumably co-opted. This is unsurprising, seeing as in absolute terms the PP took more voters from the Greens than any other party. 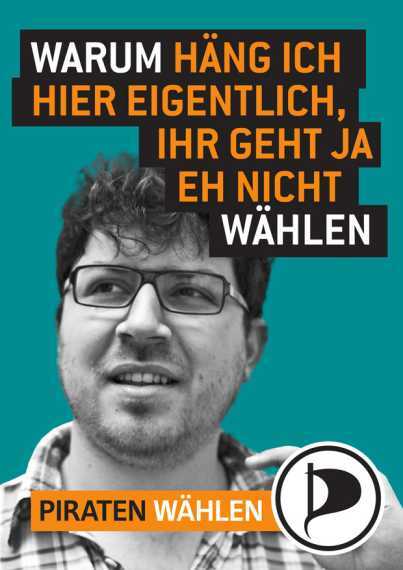 It is noteworthy that the Piratenpartei has been using an advanced voting system called Approval Voting, which is phenomenally representative and resistant to tactical voting. You can see that in these Bayesian Regret figures. So in a way they are already confronting the “castrated notion of participation” you speak of. For game theory nerds (and fans of Dawkins and his ilk) this portends a possible resilience to co-opting, and a superior ability to maintain greater representation of the wishes of its constituents. In any case, an excellent analysis of this complicated issue. Certainly better than anything I’ve read in the mainstream media such as the Guardian.